Werner Herzog is a dangerous director. Not content with simply make believe, he appears to enjoy a masochistic relationship with actually putting himself through his own film’s narratives and challenges. Perhaps he feels that it yields the best results but it’s obvious when watching any of his films that more blood, sweat and tears have gone into making them than pretty much any other filmmaker would dare try and attain to. Aguirre, The Wrath of God showcases the more extreme end of this relationship and is perhaps only toppled by his later film Fitzcarraldo. Aguirre takes us straight into Conrad country, into the Heart of Darkness. It’s the mid-16th century and the Spanish Conquistadors are traipsing through the most inhospitable of environments to find El Dorado, the so-called City of Gold. The film opens with a breathtaking shot of an Inca mountain hidden by fog. It takes a second to adjust to what is actually being presented until tiny moving dots on the mountainside are revealed to be people and a clear sense of dramatic scale is achieved. Again coming back to the Herzogian ideal of “let’s actually do it”, it becomes a breathtaking, perhaps even daring feat and a wonderful way to open the film. Like many of Herzog’s best films, the lead is played by psychotic actor Klaus Kinski who was almost certainly mad. One look into his eyes can reveal all sorts of insanity and this works wonders for his character who is instantly believable and dangerous. Though not initially in charge, he’s a clear pillar of authority in Gonzalo Pizarro’s army so the eventual mutiny that leads to the second half of the film is unsurprising. As Kinski’s character Don Lope de Aguirre whispers to his comrade “We’re going to go under” at the sight of the river they’re going to traverse on rafts, it feels as though he’s really talking to camera, almost pleading with Herzog to turn back from his own mini Conquistador adventure. The rafting section of the film is a particular highlight and it’s clear that the actors are in as real danger as the characters themselves. Fighting both the violent current of the river and the poison darts and spears of the native Indians, it seems like a constant uphill struggle for everyone. Determination to bring Catholicism and apparent religious order to the natives drives the characters on to greater and more totalitarian ideas, happily ignoring the hypocrisy of their own actions. The film splits when the group decide to try and form two separate groups as so to rest the head of the army while Aguirre finds the City of Gold. This sows the seeds of mutiny and the group become a brutal metaphor for society’s greed and desire for wealth. Kinski becomes gradually more and more insane as his rebellious group become smaller and smaller with constant attacks and misfortunes. This is a dramatic and unnerving performance, as it’s clear Kinski really isn’t acting at some points. One scene springs to mind in particular, where the group goes ashore to find food but only to be attacked. With Aguirre angry at his troops for ignoring the danger just for food, he lashes out with his sword and genuinely smashes one of the extras on the head with its hilt. 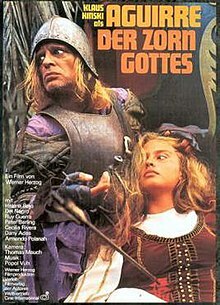 Luckily he was wearing a real helmet and was only concussed (as can be seen by his staggering away) but Herzog himself has said Kinski could have easily killed the extra. This element of real danger brings the feel of a documentary to the film and its action is therefore nerve-racking. As film draws to as close, Aguirre is left alone on the raft with nothing but monkeys for company. His comrades are all dead, either from starvation or poison and yet he’s still determined to conquer. A ship is seen perched at the top of a tree, suggesting that he doesn’t stand a chance against this persistent and powerful terrain. The final ode from Kinski is again powerful and complimented superbly by the ever subtle and pulsating score from Popol Vuh. Aguirre is released as part of the Herzog/Kinski box set from Anchor Bay. All the films are magnificent and the extras on this disc in particular are brilliant. Mainly down to the addictive and informative commentary from Herzog and Norman Hill, it tells of the genuine troubles that plagued the filming and it seems that production of the film itself was just as challenging as the original Conquistador exploration. There are very few films similar to Aguirre, The Wrath Of God. Very few directors since have got the sheer will power to sustain such a project and Herzog is a true original. This makes the film instantly refreshing and a must watch for those after a more dangerous cinematic experience.